The nation’s largest, proven, cost-effective small business assistance program invites you to the celebration. For nearly 40 years America’s Small Business Development Center (SBDC) Network has helped aspiring and emerging small business owners achieve the American dream of entrepreneurship. This March, SBDCs from around the country are coming together for one special day to celebrate their work, impact and most importantly their clients– America’s small businesses. To celebrate the collective impact and success SBDCs have across the nation and in local communities each year, America’s SBDCs are hosting the third annual #SBDCDay on March 20th, 2019. 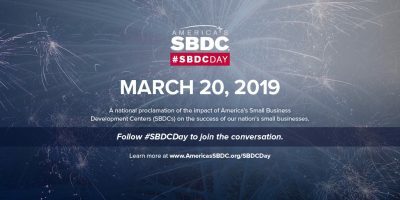 SBDC Day is a national movement to help share the small business success stories and notable impact SBDCs have fostered in communities nationwide. With nearly 1,000 locations across the country, SBDCs provide local businesses and entrepreneurs with the resources needed to succeed. In 2017, America’s SBDC clients experienced annual sales growth of 18.1%, almost 4.5 times more than the national average. SBDC assistance resulted in 93,471 jobs created; $7 billion in sales growth; $5.9 billion in capital investments; and 14,716 new businesses started. Just at NJSBDC at New Jersey City University, over 3,400 entrepreneurs have joined the growing network since its inception. On Wednesday, March 20th at Kearny, NJ’s premier business space “Kearny Point,” the NJSBDC at NJCU will host their most popular event “Social Media for Small Business” + a Special “SBDC Day” Agenda with special guests, giveaways, business showcases, and more!